The A-Designs Audio EM-Silver has a darker tone than the P-1, EM-Red, and EM-Blue. Its sound is based on a custom-wound steel output transformer, which makes it an excellent match for ribbon microphones since steel transformers were widely used in the early days of recording and broadcast. It was the combination of steel transformer and ribbon mic that gave broadcasters and singers that “voice of god” sound that has defined vocal recording and the amplified spoken word for decades. 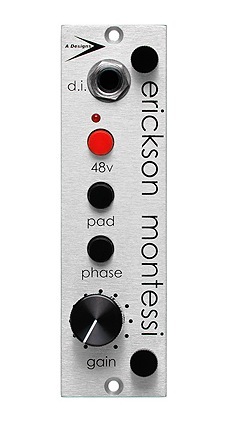 The EM-Silver is a great preamp for bass guitar and keyboards. And in the world of percussion, it’s a great choice for kick drum. For brighter sound sources, the EM-Silver is the preamp of choice when you want less top end or a vintage-type sound. For a true vintage sound, use the EM-Silver with ribbon mics, or on modern, brighter condensers to smooth out top end. If you like vintage Neve, you’ll love the EM-Silver.